Keep track of your card balance in your eWallet. The TNG app is available for Android and iOS devices. Edited by Dafansu, 02 September 2018 - 06:18 PM. Edited by Wt_know, 02 September 2018 - 06:50 PM. Can with the QR code but for certain things for now. Edited by Dafansu, 02 September 2018 - 06:53 PM. I just download the app. Quite good leh. Can show the touch and go balance though my hp. Under faq, there is no mention about can top up. It states can check status and balance. Hopefully future update will be able to top up using this app. It will be super convenient to use by then. Edited by Yewheng, 02 September 2018 - 08:15 PM. There’s already a reload function in the app, I’ve yet to try, not sure if Singapore credit card can use or not. Thereâs already a reload function in the app, Iâve yet to try, not sure if Singapore credit card can use or not. The reload function is for the App wallet part. Not for reloading the TnG card. Edited by Cypher, 02 September 2018 - 10:39 PM. So what can the app wallet do? If like paywave/Samsung pay/apply pay it will be lagi best! Like that don't have to worry about your card expiring. Yes. You can add Singapore credit card to top up your touch and go card, very useful so no need to find top up station at the check point liao. Thanks brother for sharing such useful app! Only can top up the e-wallet in your app, not your physical card. So anybody can confirm, is it top up to the app E wallet or the TNG card? If can top up the card, then really superb cos no need worry card expire liao. Edited by Cheesey74, 03 September 2018 - 09:53 AM. Seems like the reload is to the app account, aka wallet. May need to wait to reload physical card. How can I reload my Touch ‘n Go App account? You can reload your account via online banking (FPX), debit/credit card and Touch ‘n Go App Reload PIN. No. You are still required to download and register the Touch 'n Go eWallet account. The MYTouchnGo Portal only manages your Touch 'n Go cards while the Touch 'n Go eWallet is an eWallet that allows you to make payments and more via the mobile app. Edited by Dafansu, 03 September 2018 - 10:24 AM. Don't think u can reload the card yet and the function has been removed for now. Three days ago, Touch ‘n Go published the initial version of its mobile wallet. We believe this is the first step towards providing a digital payments platform to our customers. 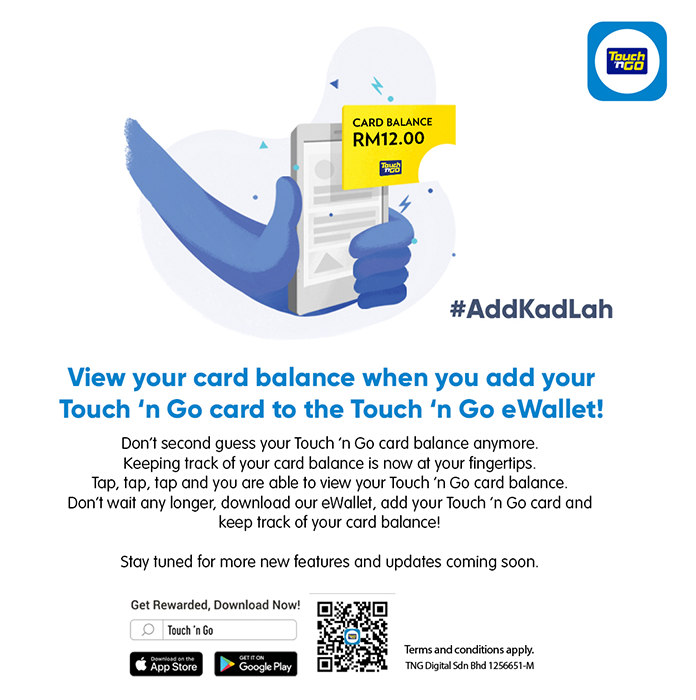 The mobile wallet will ensure that you are able to conveniently expand the use of Touch ‘n Go services in multiple retail instances, not just on the nation’s toll and transit infrastructure. Touch ‘n Go cards will continue to exist and function as per normal. We have since received much feedback, positive and negative. We thank you for taking the time to share your views with us. We have received the most feedback on the introduction of an additional reload channel for your Touch ‘n Go cards through the Pick Up Device (PUD). Your feedback indicates that the PUD method could cause inconveniences, and we are addressing those. 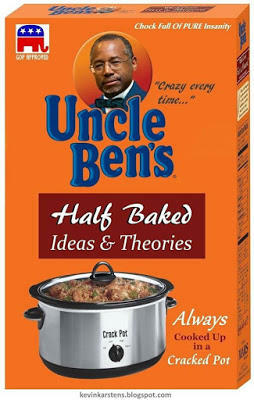 We have discontinued this for now and will reintroduce this additional reload channel when refinements are made to it. Please note though that all other Touch ‘n Go reload channels are working as per normal. As our customers, you have always asked us to add reload channels for your convenience and the PUD is one such channel that is free of charge. We will continue to listen to your requests and will further explore more convenient reload channels for Touch ‘n Go cards as we progress. 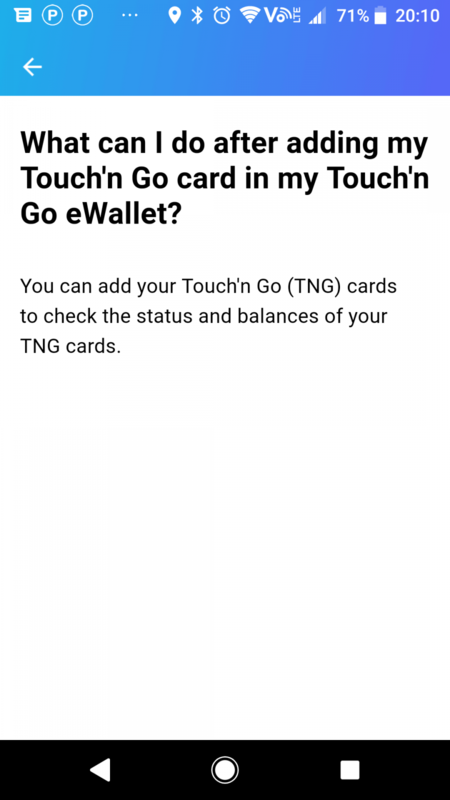 The Touch ‘n Go mobile wallet that you have on your devices today is in its infancy and is the first version of the services we want to bring you. We will be making multiple enhancements to it in the months to come.  We are expecting better user interfaces and additional acceptance points. Amongst other, today, you can already use the wallet to purchase cinema tickets, do pre-paid top up’s and also purchase air tickets. We seek your patience as we introduce new services for your use. We want to become better and we look forward to being beside you as we enter the digital age. Make no mistake, you are important to us and we value the feedback we receive and will continue to act in your best interest. Edited by Dafansu, 03 September 2018 - 10:31 AM. So, what does this app do for you? The most exciting thing in the line up is that you're able to top up your physical TNG cards, but the bad news is that it isn't exactly as convenient as it should be. You can transfer an amount from the app to the physical cards, but the catch is that you need to go to a designated Pick-Up-Device (according to the website, these machines are placed at strategic locations like convenience stores and petrol stations) within 24 hours to complete the process. So inconvenient.. Hope for them to released an updated version that could top up through the app.